I've always had a soft spot for this church, ever since I first visited it on a fierce November afternoon and took shelter from a storm here. Coming back in the stillness of early summer the following year with a camera, I actually spent most of the time just sitting quietly and thinking. It was a delight to come back seven years on and step into that stillness again. 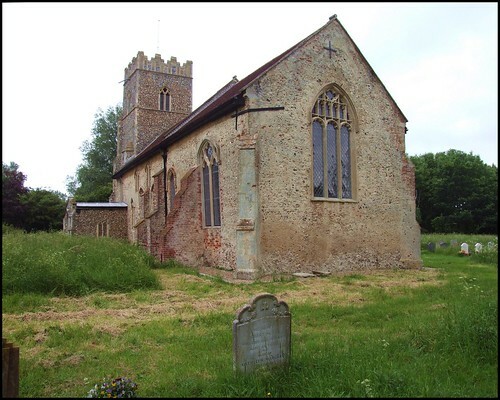 This church strikes me as a perfect example of a rural Suffolk medieval parish church, with a sense of its past, a seemliness about its present, and a feeling that it is suitable, for now at least, for the liturgies of the Established Church. It is the Elizabethan Settlement made solid and brought up to date by successive generations, for whom it now acts a touchstone. Until a few decades ago, the situation of this church was a remote one, out in the fields, with a couple of ancient cottages for company. Arthur Mee describes walking out to it in the 1930s, but now it is difficult to spot unless you know where it is, for modern housing lines the lane from the road, and St Andrew has joined its straggling village. But for all that, you still enter the churchyard through the narrow lane between the two cottages, and to do so is to step back in time. This is a thoroughly welcoming church, that I've never found locked. There is a fourteenth century tower, and a lovely mixture of windows. On the north side there's a clerestory but nothing else. The south side retains other windows. An external piscina shows the site of a transeptal chapel, now vanished. Inside, this is one of the many quiet, tidy churches of central Suffolk; not terribly exciting, perhaps, but with a great sense of continuity, and of being at the heart of a faith community. In the chancel, a 15th century bench end depicts a tower (often a symbol of Heaven in medieval days). On closer inspection, you can see a face peeping out of a window near the top. I wondered if this is related to the carving at nearby Tannington, which shows a woman directing a man (or possibly a child) into a tower? Almost certainly, it represents 'visiting the prisoner', one of the works of mercy. Another mutilated carving shows a man riding on the back of a lion, which is rather jolly. A finely carved monk has lost his head, and whatever it was he was holding. Another figure is a wodewose, an East Anglian wild man. Again, I found myself sitting and thinking, taking it all in. There is so much here that pleases the eye and lifts the heart - even the decalogue boards, which most of us find uncomfortable to dwell upon too deeply, are a beautiful pair from the late 17th century. Best of all is the angel on the font who gazes solemnly up the nave. In the nave, there is a copy of Murillo's The Two Trinities; a week later, I saw a small print of this on the wall at Ipswich St Thomas - I wonder if they know that there is a more splendid version near at hand? A modern carved Madonna and child greets the visitor in the north west corner. Kettleburgh isn't a church that many people visit. But if you fancy a pleasant afternoon cycling around quiet narrow lanes, taking in a few interesting and welcoming churches, you could do a lot worse than come here. Nearby are Brandeston, Monewden, Cretingham, Hoo and Charsfield. And back to Ipswich in time for tea.